The 'Snow Bomb' that hit over the weekend has led to school closures in some areas today. Thankfully, with the way we work and teach these days, coupled with the way pupils learn, it doesn't necessarily have to mean a wasted day. Our eBook library at books.dret.cloud has already seen a spike in hits this morning. Stuck knowing what to read? 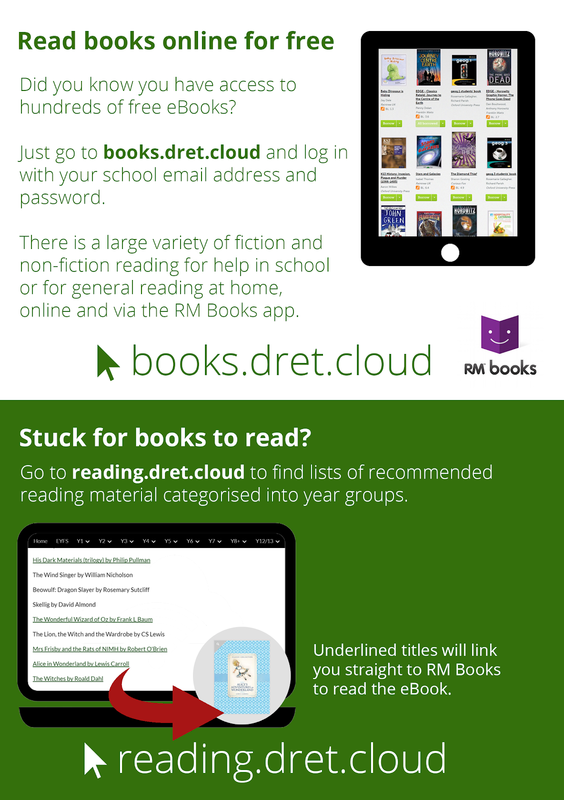 Why not check our recommended reading lists at reading.dret.cloud. With tools such as Google Classroom being used widely across the Trust, teachers can stay in touch with their students remotely as required - either using it as a message board, or setting work, directing students to websites or eBooks, or other general updates that don't need face to face interaction. With such a widespread geography of schools, we have been keen on video conferencing for ages - but on days like today, these tools really come into their own. We love Appear.in and Google Meet for meeting online, and I for one plan on using it lots today with colleagues up and down the country. For our staff, we have online CPD that can be undertaken remotely at awards.dret.cloud without needing to be in school. Already today we have seen staff taking advantage of a school closure by signing up for courses which is fantastic to see. Times really have changed! Remember the days when there was nothing else to do apart from pull the duvet back over your head and hibernate for the day?! If you are a DRET staff member or student, you can see all of our training videos on the tools mentioned above at training.dret.tv or if you want to practice video conferencing then I can be your guinea pig if you need someone to call.